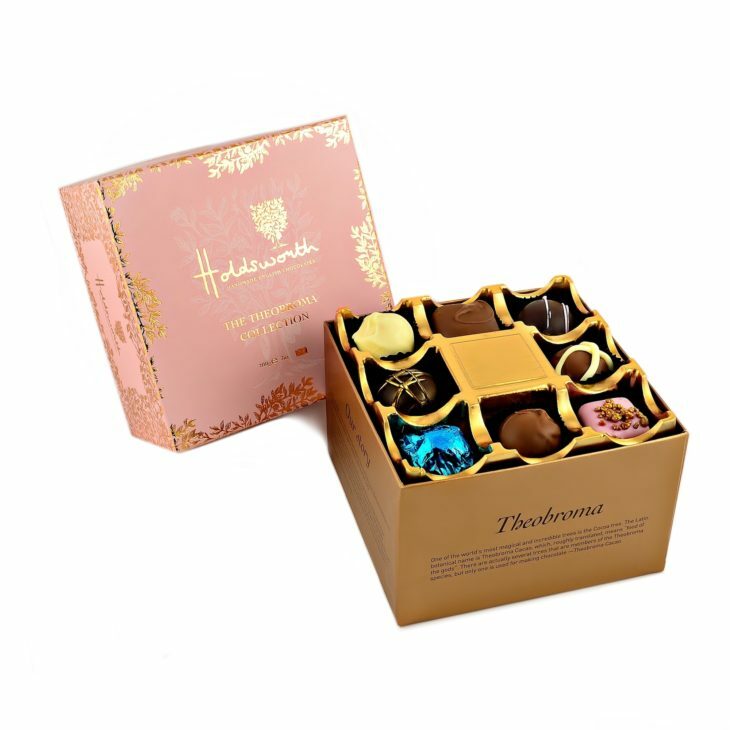 The Theobroma Collection showcases all our most popular chocolates in one irresistible classic Holdsworth Chocolates box. A gorgeous selection of handmade milk, dark and white chocolates, confections made to melt in your mouth. 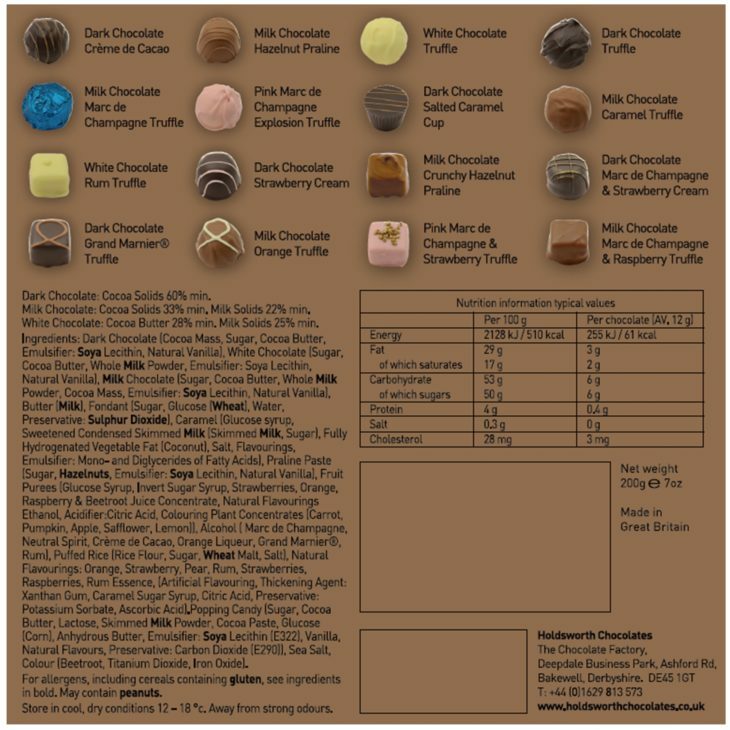 From Milk Hazelnut Praline to seductive Crème de Cacao Truffle and many more. 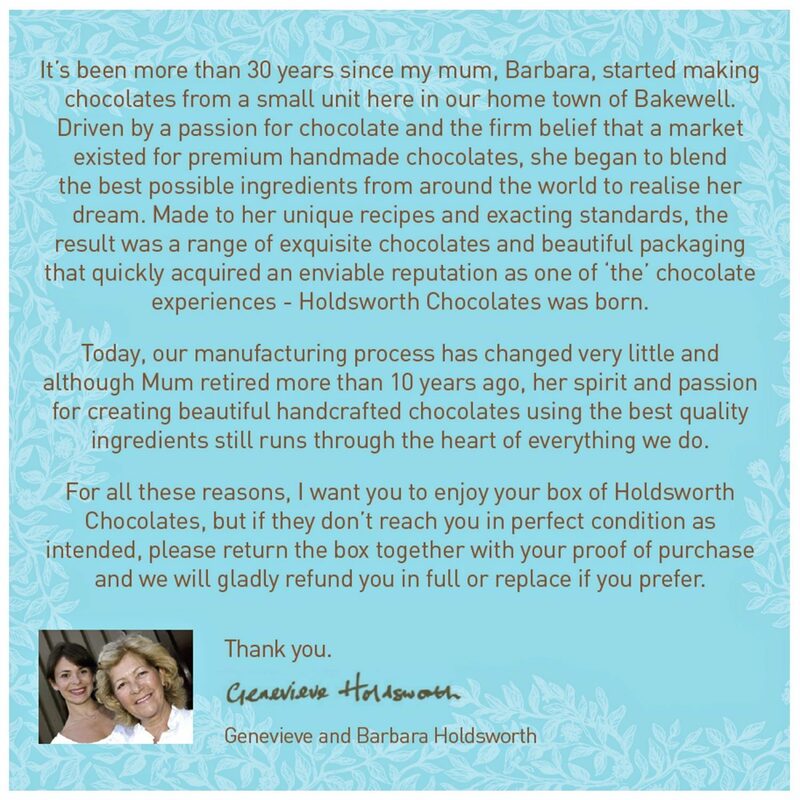 This stunning box also comes in Blue – click to view. Ingredients: Dark Chocolate (Cocoa Mass, Sugar, Cocoa Butter, Emulsifier: Soya Lecithin, Natural Vanilla), White Chocolate (Sugar, Cocoa Butter, Whole Milk Powder, Emulsifier: Soya Lecithin, Natural Vanilla), Milk Chocolate (Sugar, Cocoa Butter, Whole Milk Powder, Cocoa Mass, Emulsifier: Soya Lecithin, Natural Vanilla), Butter (Milk), Fondant (Sugar, Glucose (Wheat), Water, Preservative: Sulphur Dioxide), Caramel (Glucose Syrup, Sweetened Condensed Skimmed Milk, Sugar, Water, Cocoa Butter, Modified Starch, Thickener: Agar, Flavours, Emulsifier: E471-Sunflower Lecithin, Salt, Acidity Regulator: Citric Acid, Preservative: Potassium Sorbate), Praline Paste (Sugar, Hazelnuts, Emulsifier: Soya Lecithin, Natural Vanilla), Fruit Purees (Glucose Syrup, Invert Sugar Syrup, Strawberries, Orange, Raspberry & Beetroot Juice Concentrate, Natural Flavourings Ethanol, Acidifier: Citric Acid, Colouring Plant Concentrates (Carrot, Pumpkin, Apple, Safflower, Lemon)), Alcohol ( Marc de Champagne, Neutral Spirit, Crème de Cacao, Orange Liqueur, Grand Marnier®, Rum), Puffed Rice (Rice Flour, Sugar, Wheat Malt, Salt), Natural Flavourings: Orange, Strawberry, Pear, Rum, Strawberries, Raspberries, Rum Essence, Popping Candy (Sugar, Cocoa Butter, Lactose, Skimmed Milk Powder, Cocoa Paste, Glucose (Corn), Anhydrous Butter, Emulsifier: Soy Lecithin (E322), Vanilla, Natural Flavours, Preservative: Carbon Dioxide (E290)), Sea Salt, Colour (Beetroot, Titanium Dioxide, Iron Oxide). For allergens, including cereals containing gluten, see ingredients in bold. May contain peanuts. Certified palm oil from sustainable sources. We take great care to source only the best ingredients for our chocolates, as quality has to come first in all aspects of the products and services that we offer to our customers. At the same time we believe that it is vital to support a sustainable global chocolate industry by acting with a social conscience around our commercial decisions. We apply strict criteria when it comes to the origin of our cocoa beans, both in terms of quality and provenance. They come from three continents: South and Central America, Africa and Asia. Each country has its own specialities, cocoa varieties and flavours. We work together with specially selected farmer co-operatives who support sustainable practices throughout the growing and harvesting cycle, including fair market pricing.